Great for woodworking projects,the Porter-Cable 892 Fixed-Base Router Kit offers powerful, smooth, reliable operation from 10,000 to 23,000 rpm. This easy-to-use tool lets you unlock the base and make a variety of depth of cut changes from right above the router table. 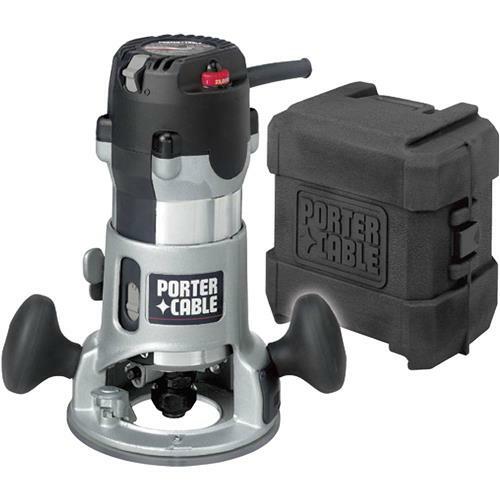 Powered by a soft-starting, 12 amp, 2-1/4-horsepower motor with full-time electronic feedback for constant speed under load, the 892 can cut through molding and hard woods with speed and efficiency. For versatility, the motor moves easily between bases. Designed for productivity, the 892 offers a range of helpful, user-friendly features. A dual-position switch allows you to cut power and yet still maintain complete control of the router with both hands still on the rubber coated handles. Bit changes are also a snap thanks to a spindle-lock feature that enables loosening of the collet with a single-wrench. A durable cam lever allows for quick, coarse depth adjustment and motor release.